Mala Beads for Meditation: Nourish your Soul by connecting with The Absolute Truth. In this kaliyuga, chanting the holy names of the Lord is the only way to deliver yourself from this world of miseries. Well formed beads from the neem wood for purity, sanctity and peace. To empower the mala and the mantra used, japa meditation should be practiced each day for 30 minutes. A mantra is a word or series of words chanted aloud or silently to invoke spiritual qualities. In the yogic tradition, a mantra is a Sanskrit word that has special powers to transform consciousness, promote healing or fulfill desires. A mantra is either given to you by a teacher The practice of chanting a mantra while using mala beads is called japa meditation. This style of meditation is used frequently in the yoga and Buddhist spiritual traditions. Japa meditation is generally performed while seated but can also be done standing and while walking. The mantra is repeated silently or aloud and can be repeated as slowly or as quickly as necessary to keep one’s attention focused. It is recommended to practice mantra meditation at least once per day. Meditating for at least 10 minutes will have the most benefits. How to store Mala Beads When not in use, store your mala in a special, clean and preferably sacred space. The great place to store a mala is on a personal altar or statue of a deity. We also sell beautiful mala bags to store your beads and sacred items in. 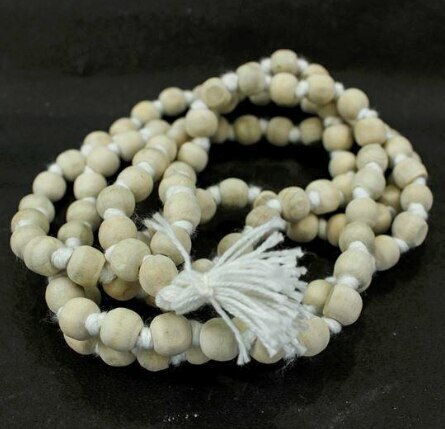 To purchase this mala from our store, click on the below link: http://www.divyamayayoga.com/products/white-beads-for-chan/34 Tags: how to chant on mala beads, mala beads meaning, mala beads for sale, buddhist mala beads, what is the guru bead on a mala, how to choose mala beads, japa mala meditation.